Last year, a team of nuclear physicists in Hungary observed an anomaly in the decays of excited beryllium-8 atoms — an unexpected preference for spitting out pairs of particles with a particular angle of separation. The bump in the physicists’ data was unmistakable, with odds of less than one in 100 billion of arising by chance. Reporting the anomaly in Physical Review Letters in January, the researchers argued that it could signify the existence of a new fundamental particle. But at first, few took notice. That changed in April with a much-discussed paper by Jonathan Feng, a theoretical particle physicist at the University of California, Irvine, and colleagues. After spending months translating the nuclear physics finding into the language of particle physics and ensuring that no particle physics experiments contradicted it, the Irvine team determined that the beryllium-8 anomaly is “beautifully” explained by the presence of a previously unknown “vector boson” — a type of particle that would wield a little-felt fifth force of nature. But even as interest mounts, so has scrutiny of the Hungarian experiment, and red flags have emerged. Oscar Naviliat-Cuncic of Michigan State University, a nuclear physicist who has examined the history and credentials of the Hungarian group more closely than most, now seriously doubts their report. “It’s, for me, sort of incredible that that was published in Physical Review Letters,” he said. In a paper of their own posted on arxiv.org in April of this year and submitted for publication, the Irvine team described the Atomki scientists’ result as follows: When a beryllium-8 nucleus undergoes a particular transition, it sheds energy and typically one unit of quantum spin — almost always in the form of a particle of light, or photon, which is the mediator of the electromagnetic force. Sometimes, the photon immediately decays into an electron and a positron, which are propelled forward by the photon’s momentum and strike the detector near one another. But for every million photon decays, one time, Feng and his colleagues hypothesize, beryllium-8 yields a different kind of vector boson, temporarily dubbed X, which mediates an obscure new fundamental force. (The four known forces are electromagnetism, gravity, and the strong and weak interactions.) This slow-moving X boson, which has a mass of 16.7 million electron volts (MeV), splits into an electron-positron pair. Because they do not get as big a forward push as the decay products of photons, the X boson’s remnants diverge at a wider angle, striking the detector at about 140 degrees. A different experiment had already searched for and ruled out the simplest version of such a particle — a 16.7-MeV “dark photon,” which would interact with the known particles in the same way (albeit more rarely) as a normal photon, and would also interact strongly with unknown dark-matter particles. 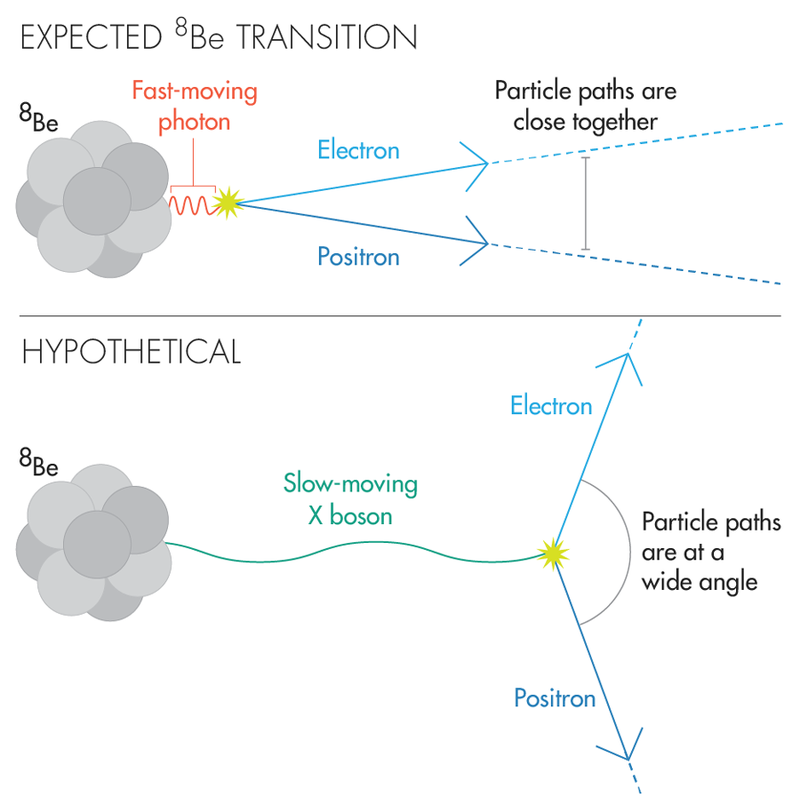 But, starting with an idea by Susan Gardner, a member of the Irvine group on sabbatical from the University of Kentucky, the group devised a variation that hadn’t been ruled out: The X boson may have avoided earlier detection because it interacts with protons and neutrons in the opposite way that photons do. Instead of interacting with protons and ignoring neutrons, the proposed X boson interacts with neutrons but is “protophobic,” ignoring protons. Researchers have already begun looking for evidence of the protophobic boson in existing data from LHCb, a particle physics experiment at Europe’s Large Hadron Collider. In the coming years, experiments at Triangle Universities Nuclear Laboratory in Durham, N.C., Thomas Jefferson National Accelerator Facility in Newport News, Va., and elsewhere could also confirm or rule out the existence of the particle. But when coverage of the fifth-force theory and plans to test it appeared recently in Nature News, Naviliat-Cuncic, who does nuclear-decay experiments, read it with raised eyebrows. “It seems that people get excited about it, but do not go and read [the Hungarian group’s] past work,” he said. When the team upgraded their experimental apparatus, the boson pandemonium disappeared. “He was very unhappy that we could not confirm his previous results with our new spectrometer,” said Attila Krasznahorkay, the current leader of the Atomki group. De Boer’s bosons failed to reappear in the group’s subsequent findings, but as they tweaked their instruments, they continued to strike upon new possibilities. This time, Krasznahorkay said, “We are very much confident about our experimental results.” De Boer, who died in 2010, was not involved in the new work. Given the extraordinary claim of a new boson and a fifth fundamental force, the Hungarian physicists’ problematic report hardly qualifies as extraordinary evidence. But might these scientists, on their third try, have stumbled upon a physics revolution? Their history “is reason for pause,” Thaler said, but “I still think follow-up studies on this intriguing anomaly should definitely be performed.” A bump with obscure origins has caught worldwide attention, and there’s no turning back now.